milk is left at room temperature during summers. an iron tawa/pan/nail is left exposed to humid atmosphere. food gets digested in our body. In all the above situations, the nature and the identity of the initial substance have somewhat changed. We have already learnt about physical and chemical changes of matter in our previous classes. Whenever a chemical change occurs, we can say that a chemical reaction has taken place. You may perhaps be wondering as to what is actually meant by a chemical reaction. How do we come to know that a chemical reaction has taken place? Let us perform some activities to find the answer to these questions. You must have observed that magnesium ribbon burns with a dazzling white flame and changes into a white powder. This powder is magnesium oxide. It is formed due to the reaction between magnesium and oxygen present in the air. Take lead nitrate solution in a test tube. Add potassium iodide solution to this. 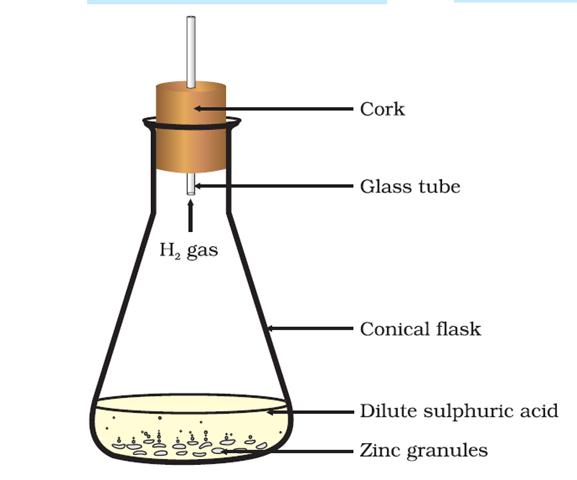 Take a few zinc granules in a conical flask or a test tube. Add dilute hydrochloric acid or sulphuric acid to this (Fig. 1.2). CAUTION: Handle the acid with care. Do you observe anything happening around the zinc granules? Touch the conical flask or test tube. Is there any change in its temperature? As we observe the changes around us, we can see that there is a large variety of chemical reactions taking place around us. We will study about the various types of chemical reactions and their symbolic representation. Thanks for the informative read. Definitely bookmark worthy.